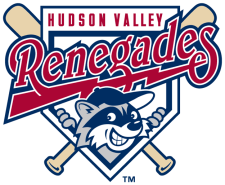 The Hudson Valley Renegades rallied late to earn a 5-2 victory over the Brooklyn Cyclones on Wednesday night at Dutchess Stadium. The Renegades used a big seventh inning to take the lead combined by a no-hit performance out of the bullpen to guide the Gades to victory. The Renegades took the lead in the second early, scoring the first run of the game. Nicholas Schwaner drew a walk to lead off the inning. Schwaner would later score on a ground out by Mayobanex Acosta to give the Renegades a 1-0 lead. Brooklyn battled back to take the lead in the sixth inning. Rylan Sandoval singled to left followed by a walk to Cody Holliday. William Cherry drove home both runners with a two run double to center that gave the Cyclones the lead 2-1. The Renegades took back the lead for good in the seventh inning, striking for four runs in the inning, Burt Reynolds was hit by a pitch. Reynolds would make it around to score a batter later when Schwaner hit an RBI double to right. Steven Tinoco then drew a walk. Acosta drove home two runs with a single to center, then later scoring himself on a single by Chris Winder. The rally gave them a 5-2 lead which they retained through the rest of the game. Devin Fuller made the start, pitching 6 innings and allowing 2 runs on 3 hits with 2 strikeouts and a walk. Steve Hiscock picked up the win, pitching 2 no-hit innings while striking out 3 in the process. Hunter Hill got the save with 1 no-hit inning with 1 strikeout and 1 walk. The Renegades head to MCU Park to continue the series against the Cyclones. Joey Dettrich (1-0, 1.69) will make the start for the Renegades, facing Chris Hilliard (1-0, 3.00) for Brooklyn.